We are going to cover a lot of ground over the next couple of days. This trip had a number of goals that I will explore in a future post. The goals necessitated a couple of longer travel days. After a very late night on Saturday morning, we set the alarm for 8:00 am. Getting cleaned up and having breakfast at the hotel, we packed, checked out of the hotel and were on the road shortly after 10 am. Jack set the GPS for town center in Clerxaux. We drove across most of Belgium and into the tip of Luxembourg. It rained heavily over the first two hours of the drive. As I told Sharon and Jack, I am getting ! @#$%^&* tired of the rain. It took us about four hours to drive from Ghent to Clervaux. We had a nice lunch in the town square. After lunch, we toured The Family of Man, a exhibit of photos collected by Edward Steichen in permanent display in Clervaux Castle. As Sharon said, we could have spent hours looking through the photos. Needing to drop one car and pick up another car, we started toward Luxembourg Airport. Unfortunately, the GPS lead a little astray. We ended up on a dead end dirt road paralleling the freeway. As part of this leg, we were essentially driving the length of Luxembourg. We finally found our way to the airport about 4:00 pm, but then had some struggles figuring out where Hertz was. The Luxembourg airport is very small. We picked up the car that we are going to have for the next week. Driving from Clervauz to Luxembourg City, we covered almost the entire length of the country of Luxembourg. 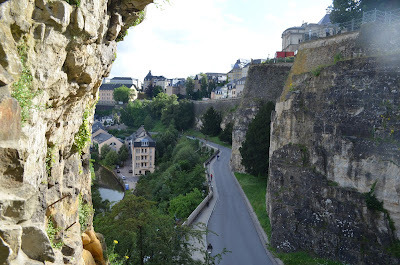 We finally got to Luxembourg City about 5:00 pm. We are staying at the La Place D'Armes for one night. This hotel is in the city center on a pedestrian mall. I dropped Sharon and Jack at the edge of the mall. Jack brought back one of the hotel staff who guided me to the hotel through all of the people walking in the mall. The hotel gave us a nice upgraded multi-level room. This turned out to be a little like the Orvieto experience. I hadn't read the Luxembourg book. We got there very late in the day and weren't organized about what we were going to do. Jack had wanted to come to Luxembourg so I was kind of letting him drive. After some initial confusion, Jack led us to the Bock casemates. We toured the underground fortification. Afterwards, Sharon and Jack walked along the city walls, while I explored the area.